Catch up with friends and family as you enjoy an outdoor dining experience. Club Price: £413.99 - Save: £46.00 Join Today! Summer dining at its best. 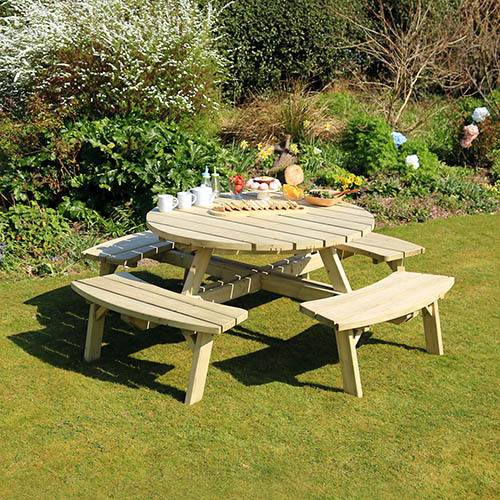 The Rose Round Picnic Table features four separate bench seats that can easily accommodate up to 8 people. A parasol hole is included in the design for you to add your own canopy if you require some shade in the midday sun. Great value, the Rebecca Table is manufactured from high quality, pressure treated, FSC® Certified timber to last longer, and comes with 10-year guarantee against rot. It's strong, durable and can be used year after year. Dimensions: 2.10m diameter x 0.75m, assembly required - This product is 2-person assembly.